Ukraine: 4 Key Debates Yet To Shake Out : Parallels The deposed president is on the run. There's uncertainty over who will emerge as the country's new leader. Its economy is in shambles. And Russia and the West are divided over what they want. 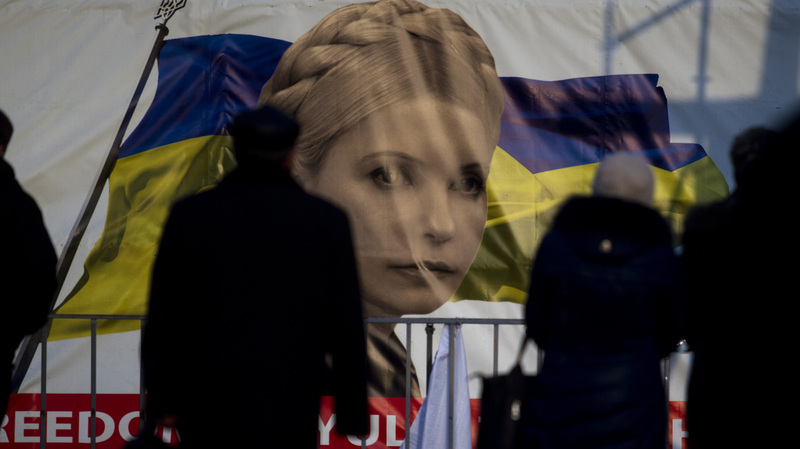 People pass by a portrait of prominent opposition leader Yulia Tymoshenko at Independence Square in Kiev, Ukraine, on Monday. Tymoshenko, a former prime minister, is one of the leaders who have emerged after the ouster of President Viktor Yanukovych, but she is also a controversial figure. Ukraine's deposed President Viktor Yanukovych is on the run. There's uncertainty over who will emerge as the country's new leader. Its economy is in shambles. And Russia and the West are divided over what they want next. Leadership: Parliament named its speaker, Oleksander Turchinov, interim president after a vote Sunday. He's expected to stay in that position until elections scheduled for May 25. Turchinov is an important member of the opposition and an ally of Yulia Tymoshenko, the former prime minister who lost the presidential race to Yanukovych in 2010. She was in prison on what critics of the previous administration said were trumped-up charges. Tymoshenko was freed Saturday after a parliamentary vote. Soon after her release, she said she would run for president, but her lawyer denied Monday that she'd made the statement. Tymoshenko is a divisive figure: She was a hero of the Orange Revolution in 2004, after which she became prime minister. But, as the BBC noted, "critics point out that she made a fortune of her own." Indeed, The Guardian reported that when she addressed Kiev's Independence Square after her release, "she was received politely, but by no means rapturously." Other prominent figures in the opposition movement that ousted Yanukovych include Vitali Klitschko, the former boxing champion; Arseniy Yatsenyuk, whom the U.S. apparently backs, according to a leaked phone conversation; and Oleh Tyahnybok of the far-right Svoboda. Divisions: The protests against Yanukovych and his subsequent ouster have rekindled deep-seated divisions in Ukraine. 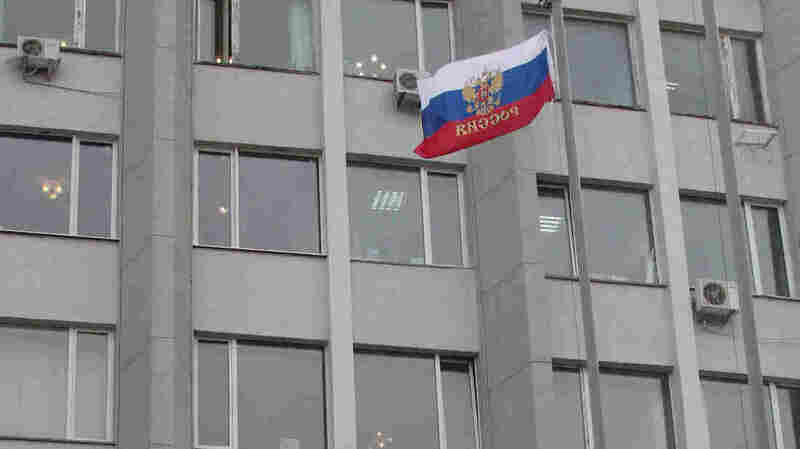 A Russian flag flies outside the state and city administration building in the Crimean city of Sevastopol on Monday. As we told you previously, the biggest protests against Yanukovych were in the Ukrainian-speaking west of the country. But the deposed president drew his support from the Russian-speaking east and south — and that's where he reportedly headed after his ouster. Indeed, tensions are already high in Crimea, Ukraine's only Russian-majority region. Crimea was part of Russia until 1954, when then-Soviet leader Nikita Khrushchev gave it to Ukraine. Crimea remained with Ukraine after the dissolution of the Soviet Union in 1991, but it is still home to a Russian naval base and, as The Wall Street Journal notes, remains a Russian bastion. Economy: Ukraine's economy has been in trouble for several years and has struggled to emerge from a recession. The unrest has led to its currency crashing, capital flight and falling foreign exchange reserves. Indeed, much of the current unrest began as a protest against Yanukovych's decision last November — in the face of threatened Russian action — to walk away from a trade and political agreement with the European Union. Russia then stepped in and said it would buy $15 billion worth of Ukrainian bonds to give the country a financial lifeline. So far, it has bought $3 billion worth of bonds and said it would wait until a new government is formed before making its next purchase. With a new pro-Western interim government in place, bonds and stocks rallied on Monday. Still, the interim government says it needs $35 billion to avoid default. The head of Ukraine's central bank, Ihor Sorkin, quit; Parliament replaced him with Stepan Kubiv, a lawmaker from Tymoshenko's political party who has banking experience. Russia And The West: After this weekend's developments, the EU said it was ready for talks on the agreement with Ukraine — but only after elections in May. "The EU now finds itself in a delicate balancing act. It had thought that it had lost Ukraine to Russia and was beginning to consider its longer-term options for engaging with the country, which borders four EU member states. "Now history has speeded up and the EU finds itself trying to come up with immediate solutions to handle the economic turmoil and the fallout from the collapse of the government, while doing everything it can to keep Russia constructively engaged." Russia says it would honor all "legally binding" agreements with Kiev, but it's clearly not pleased, and its concerns aren't just geopolitical. Russian Foreign Minister Sergei Lavrov called Ukraine's new leaders "extremists," and officials criticized the West for supporting the interim government. "We may not like Russia's view of Ukraine or even understand it, but [Ukraine is] still of great interest to Russia," Matthew Rojansky, director of the Kennan Institute at the Wilson Center, said in an interview last week. "We should try to avoid confrontation with Russians on the issue, because we can't devote the resources that Russia will deploy to maintain its interests in Ukraine."